Blinded by science, benchmarks and IMA Sectors which bear little, if any, relevance to your clients’ investment requirements or attitude to risk? 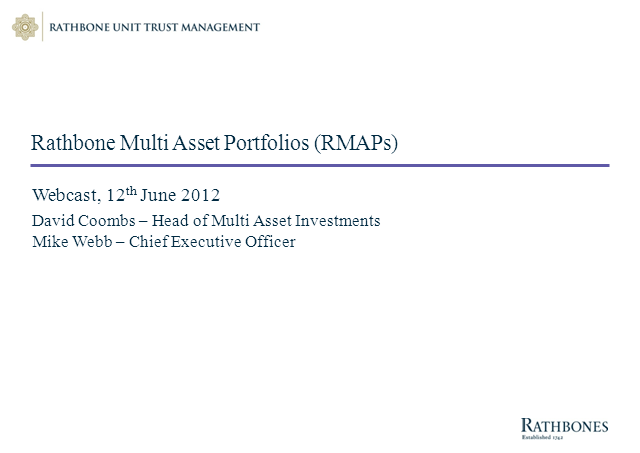 The Rathbone Multi Asset Funds could be the answer! Please join David Coombs, Lead Manager, who at our 3 Year Anniversary will explain how we have built our offering on the four key investment principles which sit at the heart of our Wealth Management business. •Asset Allocation must be dynamic. •Investment views must be forward-looking. •Portfolios must have specified risk targets. If you would like to submit a question during the live event, please use the ‘questions’ tab at the top of the video screen at any point during the webcast. Will looks at China’s One Belt One Road initiative. Is this is Chinese solution to global economic blues? Hear how the multi-asset strategies are allocating to the region.